The man was successfully pulled from the water by a passer-by. A man sparked rescue attempts from members of the public after he was found in the water near the Promenade, says the coastguard. The man was reported to the coastguard via a 999 call shortly after 10.30pm on Monday October 2. 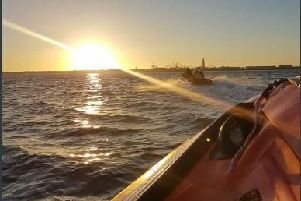 No lifeboats were launched during the incident due to the stormy weather but members of the Lytham Coastguard rescue team responded to the incident. A spokesman for the RNLI said: " A holidaymaker from the north east, in his early 20s, was taken to hospital for precautionary checks after going for a swim in the sea during strong winds at Blackpool." Ambulance services also attended what was described to them as a "serious" incident. A spokesman for the ambulance service said: "We were called out to reports of a male patient in the water. "The man was out of the water when we arrived and was conscious and breathing." The man was taken to Blackpool Victoria Hospital for treatment. His injuries are not believed to have been life threatening.